Back again! I've finally caught up with most of my emails (not done yet) and now I'm tackling new projects. It's funny how things work out for me. I'm really lucky. During the summer my graphic design work came to a screeching halt and all my efforts were concentrated on the book. Now that I've just delivered my manuscript and over 200+ photos and templates to my editor (wooohooo!) new projects are starting to pop up—interesting ones at that. I've had these box templates made for a couple of months but only had time to put them together today. They're in my shop here. You had to see them coming, right? Thank you to Lotta for naming me for the "your cover's blown" blog award. I'm truly flattered. I've always considered her work so beautiful. I'm about to run out the door to pick up the kids from school so I don't have time to mention the blogs that I'll be awarding. I'll come back later to do that. In the meantime it's nice to be back. More plans, art and ideas to be forthcoming and no, I haven't forgotten about Crafty Synergy. I hope to post there soon as well. More importantly we're watching the hurricane (Ike) approach Texas. We're on pins and needles here. just love the new little boxes. How darling are they! These boxes are beautiful!! We had luck with Ike this time (here in Miami) I can’t believe is category 2 now! I'm sending you some other friends to see these! 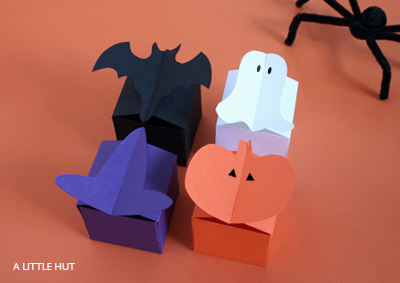 those little boxes are very cute - but jeez is it nearly Halloween already?! where has this year gone? Yes, Halloween already! This year has flown by. I think I say that every year but this year has particularly been a fast paced one.